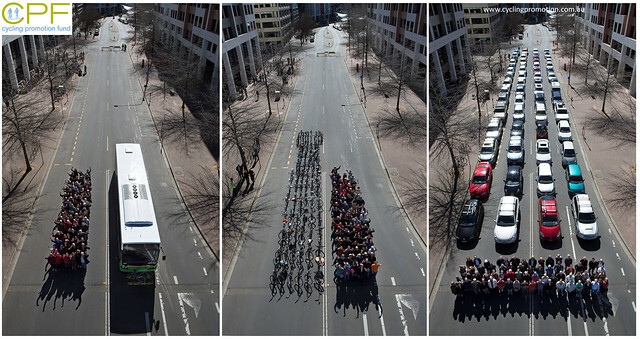 Many years ago the German city of Munster set up a photo comparing the road space taken by people in a bus, on bikes, and in cars. Earlier this month the Cycling Promotion Fund recreated that picture in Canberra, and yesterday they released it. The captured image shows the typical space occupied in a city street by three common modes of transport—cars, bicycles and a bus —- and is being made available free of charge to organisations, group and individuals to help promote the efficiency of public transport and cycling in congested cities. 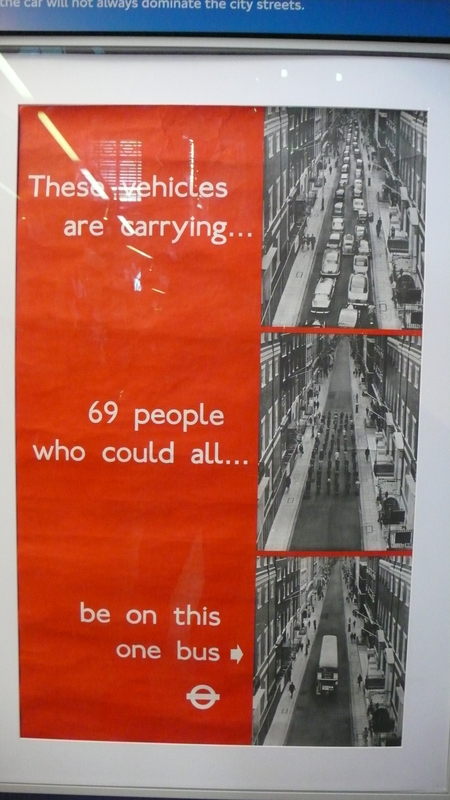 The project used 69 people, as this is the capacity of a standard Canberra bus, and 60 cars, as this is the number occupied on average by 69 people. Like the old photo from Munster, it very clearly shows how moving large numbers of people by car around cities is not efficient — something people sometimes seem to forget when praising such developments as electric cars. But unlike that old photo (and a similar photo I recall being done on Melbourne’s Swanston Street which seems to have never been seen since), CPF have made the photo freely available at high resolution. Next → Next post: The latest sponsorship at Southern Cross station? IKEA seat covers. Perhaps they can also figure out a way of graphically displaying how it takes 2 hours to get by public transport to somewhere you can drive to in 17 minutes. I’m afraid I have to agree with enno. I hate driving, but I drive to and from work every day, because it isn’t plausible to walk, cycle or take pt to get there. @Mike, is there a date on that picture? It looks much older than the German one. Oh, and anybody who uses this blog post to complain that PT doesn’t work for their specific commute is missing the point. It’s interesting that the Canberra one uses exactly the same number of people, even thought the London bus is double-deck. This illustrates why most cities don’t have a traffic problem, they just have too many cars. If Transit, cycling, or walking doesn’t work where you live, that sounds like a personal problem, why would you live there? That being said, don’t feel entitled that the world should cater to your car, expect heavy delays and tough to find expensive parking. Actually, public transport works just fine for my commute. But not for everybody (such as alexander, although your comment is hardly a revelation, I think you are mistaken to be “agreeing with me”). I don’t even have a car, at the moment. Both space and time have scarcity value and opportunity costs. Public transport certainly contributes to the efficient use of road space, as those photos demonstrate. The efficient use of time is equally important, arguably more so in a high-productivity economy. There is a wide-spread, if somewhat unfair, perception, out there in swinging-voter land, that public transport advocates are hippie-types who apparently have all the time in the world to spend 90 minutes undertaking a journey that can be accomplished more efficiently in 20 minutes. Time is money, and arguably of more direct interest to “commuters” ( a word I dislike, these days people going on holidays get called commuters ) than road space. Evidence for this proposition, is that “races” between joggers, cyclists, trains and cars from middle distance suburbs to downtown seem to be staged by current affairs shows and motoring organisations about once a year, while photos such as the topic of this blog get taken about once a decade. It is easy to stage such a “race”, if you have 15 minutes of edited video to play with. However, I spent some time musing how you would illustrate that issue with a still photo, and the answer is non-obvious. A challenge to the create photographer ! enno does have a point – I’d argue most people aren’t necessarily ‘wedded to their cars’ as I’ve heard here before, but use what’s the most convenient. Traffic congestion and the hassle/expense of inner city driving and parking works in favour of PT any time. Similarly the footy, Melbourne Show, Avalon Air Show, etc have either direct rail access or good direct bus connections and win out over driving when stuffing around having to park. However the bus shown above may take much less road space carrying the same people but the potential catchment (by route or journey time) will be significantly less than the few dozen cars in the last shot. I would not be in such a hurry PT it to Chadstone from home (but have done it before … 20 minutes by bus to Dandenong, train to Hughesdale then walk around 15 minutes to the centre) when the Monash Freeway is in my back doorstep. I’m really fed up with this whole debate.As an older person riding a bike is out of the question physically, not to mention that I had a bad fall off my bike about 4 years ago and am too scared to ride now. You don’t see a lot of disabled persons cycling either – they’ll just have to join all the oldies, small children and everyone else who can’t cycle, after the revolution. I am fed up with today’s generation thinking they have the right to dictate to everyone else. And don’t get me started about cyclists and what used to be footpaths – why do cyclists need the road and the footpath? Meanwhile we pedestrians risk injuries from those who think it’s OK for them to race around on their cycles.